5-HTP (5-hydroxytryptophan) is a supplement extracted from the seeds of a West African shrub (Griffonia simplicifolia). 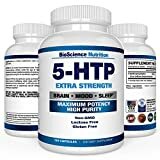 5-HTP (5-hydroxytryptophan) supplements are available in a capsules, and come in a variety of dosages. The human (and horse) body manufactures 5-HTP from L-Tryptophan, a natural amino acid found in most dietary proteins. However, eating food that contains L-tryptophan does not significantly increase 5-HTP levels. As a supplement, 5-HTP may work by increasing levels of serotonin (also known as 5-HT), one of the neurotransmitter chemicals that carries messages between brain nerve cells. 5-HTP is a popular human supplement - and is used for both mood and anxiety disorders. A typical human dose of 5-HTP is in the range of 300-500 mg a day.